I think always wanted to do karate, I remember seeing something on TV as a kid (maybe I was about 8 or 9 years old) and I was really impressed as to the super human powers of watching someone break boards with a punch and hitting trees with bare hands and feet, I didn’t have a karate class near to me but I would sometimes “play karate” with my friends when we were out in the garden on hot sunny days. I went to secondary school and found that I was a lot smaller than the other kids I liked the idea of being able to defeat the school bully despite being only half his size. This had to remain just a dream for a long time though as we lived out in the hills and I couldn’t get the local karate classes that were in Aberystwyth. Then when I was 15 a man named Danny Jones, a brown belt, opened up a karate class in our local community centre, I didn’t hesitate and joined up immediately. After my first class I was hooked, and have been ever since. I never had that fight with the school bully, karate did give me the courage to stand up to him though and that in itself was enough to put an end to his bullying. I guess he was too scared to try anything in case I showed him up in front of all his friends. So that was the start of it all. Later on I went though the colour belts and with time I got my black. Then I started competing, didn’t do too well at first but with some experience, practice and effort I started getting better, eventually becoming Welsh Champion 21 times, British Champion, European Medallist and World Champion [a short list of successes can be seen here] . Being smaller than everyone and being the weakling of the group was the start of one amazing adventure, one that I wouldn’t change for the world. Karate has taught me a lot of things but most importantly is to keep trying and never give up no matter how hard it might seem. With courage and determination you can face anything, and with time and effort you can turn a weakness into one of your greatest strengths. 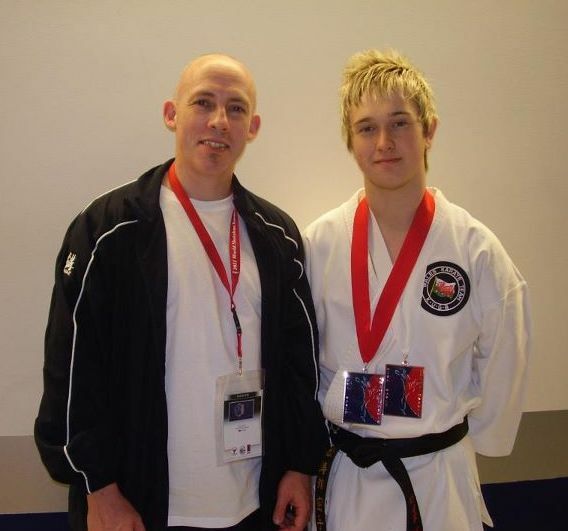 In 2010 I decided to retire from competition and with the backing of the Welsh region and Sensei Sherry himself I was immediately appointed as Kata Coach for the KUGB Wales team. Success wasn’t far behind with newcomer Lloyd Birt getting placed in both the Cadet and the Junior kata events at the 2011 World Championships in Chicago. Each international since then we have had at least one kata finalist at each international, most notably at the 2013 World Championships in Liverpool where we took four medals, also of note we also had four other semifinalists too. Such a strong performance allowed Wales take 6th place on the world medal table! Building on the experience and success, just a year later and team member Rachel Edwards became our first Welsh European Champion! The talents of Welsh Squad members are showing at home as well with Welsh karateka featuring at national events such as the KUGB Nationals, Grand Slam, and the Shotokan Cup. I feel very privileged to be able to positively influence such a strong squad and extremely talented team. I’m immensely proud of them all. Karate has allowed me to gain valuable experience as a doorman of “bouncer”. Being a lot smaller than most (ok, let’s face it, ALL) troublemakers has been a great test of my skills, understanding and ability. I learned important lessons of eye contact and body language as well as how to apply kata in a real world environment, and hope to pass on the lessons learned to Ikkyo members. Despite tournament kata often looking “pretty” I firmly believe that good kata, just like good karate, must have danger at heart. I’m CRB checked, fully qualified as an instructor and a KUGB Instructor Assessor, and First Aid trained. I am one of the very few who passed the Judges exam and Referees exam on the first attempt. And I have taught students from novice up to 4th dan black belt. If I can offer any advice it is this… train well and keep trying for improvement, there really is no end. I love karate now as much if not more than when I first started, and sharing that with the world makes me very happy indeed.